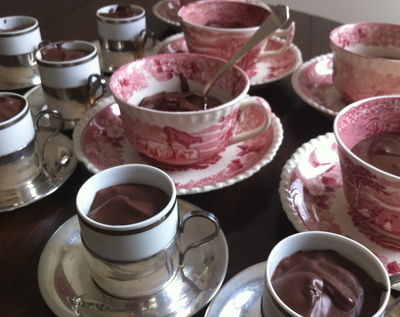 As always on the lookout for a recipe that will use a lot of eggs, I dug out my grandmother’s chocolate mousse recipe. Ten eggs later, it is as decadent as I remember – an easy and delectable treat for you and your guests. Unlike the plethora of chocolate mousse recipes: from Julia Child to my backyard egg mainstay book, “Eggs” by Michel Roux, this recipe does not call for any sort of dairy or butter. In fact, aside from the eggs, one could consider this vegan. Instead of using a double boiler to melt the chocolate, water and sugar – I used a metal bowl on top of a pot. That worked just as well and was much more economical than purchasing a double boiler. The chocolate is the consistency of icing when you add the egg yolks; there is no need to add extra water to make it creamy. I also learned that egg whites treble in volume when beaten, ending up on the floor. Next time I will use a larger bowl from the outset. This entry was posted in In the Kitchen (recipes & more), On the Farm and tagged Backyard chickens, Chocolate Mousse, Corinna Borden, eggs, Real Time Farms. Bookmark the permalink. Thank you for the recipe. I can’t wait until I try it. This looks like a fabulous recipe and I love how you displayed them in those wonderful tea cups. This looks like a yummy recipe. I love Mousse…and I haven’t made it in a while. I will need to do that soon!